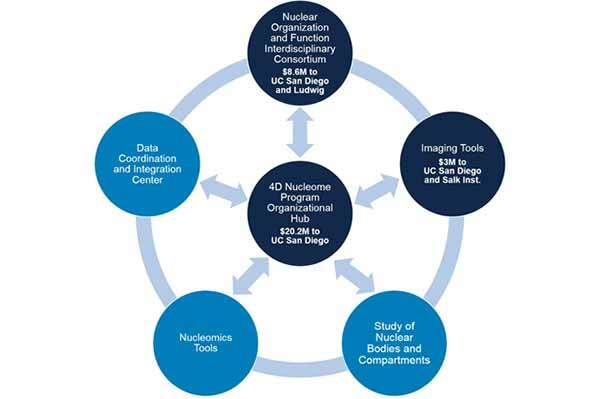 Six initiatives comprise the $120 million NIH 4D Nucleome Program, three of which are led by or involve UC San Diego researchers. The 4D Nucleome Program is a collaborative research initiative aimed at better understanding how DNA is arranged within the cell’s nucleus in four dimensions (three-dimensional space plus time) and how changes in that nuclear organization affect human health and disease. The UC San Diego researchers hail from the School of Medicine, Jacobs School of Engineering, Institute of Engineering in Medicine (IEM), Division of Physical Sciences, Division of Biological Sciences and Center for Research on Biological Systems. The 4D Nucleome Program is composed of six separate but interrelated initiatives that encompass 29 awards to 24 different institutions throughout the United States. UC San Diego researchers will receive one quarter of the program’s funding, lead the program’s organizational hub, and contribute to two additional research initiatives. The genetic basis of most diseases is unknown. For those diseases for which specific genetic risk factors have been identified, most do not involve the part of DNA that codes for proteins. Instead, most known genetic risk factors for disease are located in the non-coding regions of our genomes. A significant portion of the genome’s non-coding regions regulates exactly when and how to turn certain genes on or off, but little is known about how all that works in space and time. The 4D Nucleome Program will develop technologies, resources and data to determine how these genetic arrangements and timing are coordinated, as well as how aberrations in the nucleome contribute to human health or disease risk. A $20.2 million, five-year grant to establish the 4D Nucleome Program organizational hub was awarded to UC San Diego’s IEM, with Sheng Zhong, PhD, associate professor of bioengineering, Shu Chien, MD, PhD, Distinguished Professor of Bioengineering and Medicine and director of IEM, Shankar Subramaniam, PhD, Distinguished Professor of Bioengineering, Computer Science and Engineering, and Cellular and Molecular Medicine, and Bing Ren, PhD, professor of cellular and molecular medicine and Ludwig Cancer Research member as the principal investigators. This organizational hub will integrate the efforts of all the 4D Nucleome Program’s funded initiatives and promote cooperation and communication among participants. In collaboration with the NIH, the UC San Diego-based hub team will also fund, manage and coordinate research proposals within the Opportunity Pool, a portion of the total award amount that will be distributed as sub-awards to support new projects and initiatives addressing identified needs that could arise during the lifetime of the program. In collaboration with another one of the six program initiatives, the Data Coordination and Integration Center, the organizational hub will create a web portal and serve as a community-wide resource and point of access for all data, protocols, reagents, resources and methods developed by 4D Nucleome Program investigators nationally and globally. The second 4D Nucleome Program grant to UC San Diego and Ludwig Cancer Research, for $8.6 million over five years, establishes the Nuclear Organization and Function Interdisciplinary Consortium, another one of the program’s six initiative. The team includes Bing Ren, Cornelis Murre, PhD, Distinguished Professor of Biological Sciences, and Olga Dudko, PhD, associate professor of physics, in collaboration with Ana Pombo, DPhil, Max Delbruck Center for Molecular Medicine, Ming Hu, PhD, NYU School of Medicine, and Mario Nicodemi, PhD, University of Naples Federico II. This interdisciplinary team combines expertise in determining the spatial organization and movements of genomic material within the cell nucleus and the mathematical modeling and predictive tools of theoretical physics. Nuclear Organization and Function Interdisciplinary Consortium’s goal is to support the formation of interdisciplinary teams to create the next generation of high-throughput technologies that can produce dynamic three-dimensional maps of mammalian genomes. All of the technology and data generated by this initiative will be made available to 4D Nucleome Program participants and the broader biomedical research community via the organizational hub. A third 4D Nucleome Program initiative — called Imaging Tools — involves Mark Ellisman, PhD, Distinguished Professor of Neurosciences and director of the Center for Research on Biological Systems at UC San Diego, together with project lead Clodagh O’Shea, PhD, at the Salk Institute for Biological Studies. The two institutions will receive a total of $3 million over five years to fund the project. Ellisman, O’Shea and their teams will create genetically encoded metal nanoparticles and novel paints that will act as molecular beacons to light up genes of interest within the maze of DNA, enabling their structures to be visualized. This will allow researchers to see, for the first time, the structure of a gene within the intact nucleus. The analysis and storage of these visual genome atlases will be facilitated by the program’s organizational hub. “The DNA double helix structure showed how genetic information is copied and stored, but revealing the nucleome and 3D structure of DNA in the cell nucleus will reveal the structures that determine how our genomic information is accessed and used,” Ellisman said. Note: NIH funding beyond fiscal year 2015 is subject to change based on funding availability.